Mind Control just had a fever for a day. Trainer was just about doing back flips over him after his last work. I am completely out of the loop about everything right now. 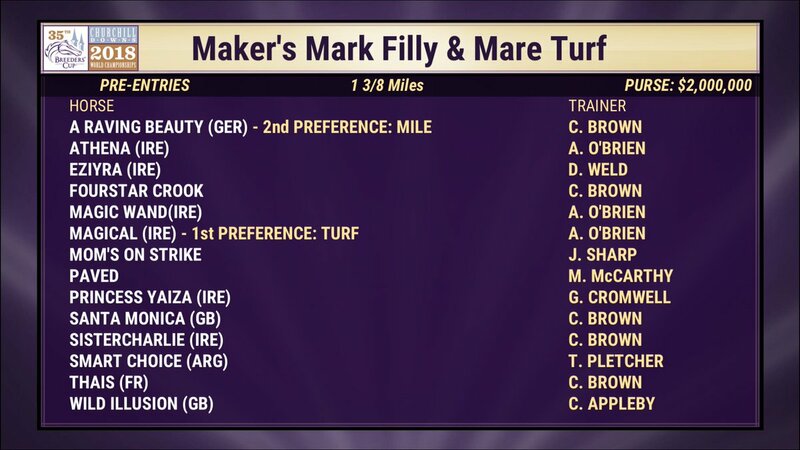 Is it seriously possible that we are going to get a field where Gunnevera, Roaring Lion, and Collected are kept out by Bravazo, Axelrod and Lone Sailor? 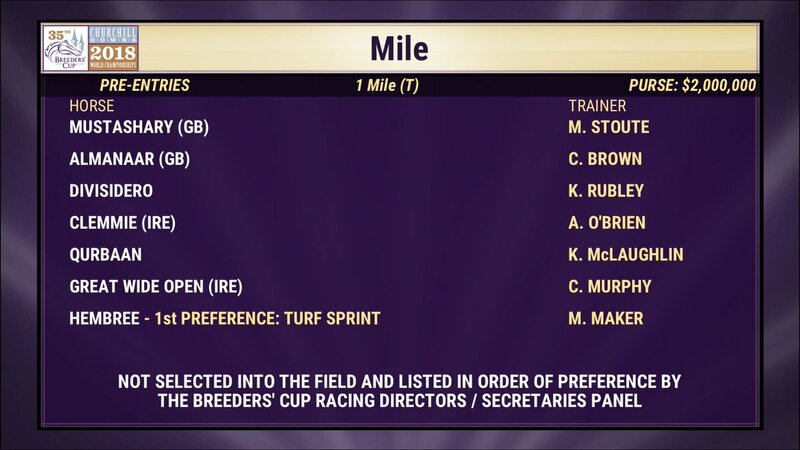 ...At this time, there are three active Breeders’ Cup Challenge race winners for the Classic pointing to the Classic. They are Accelerate, Discreet Lover, and Pavel. That leaves four slots for the otherwise highest point earners. At this time, the four active highest point earners targeting the Classic are Bravazo, McKinzie, Axelrod, and Lone Sailor. That’s it. 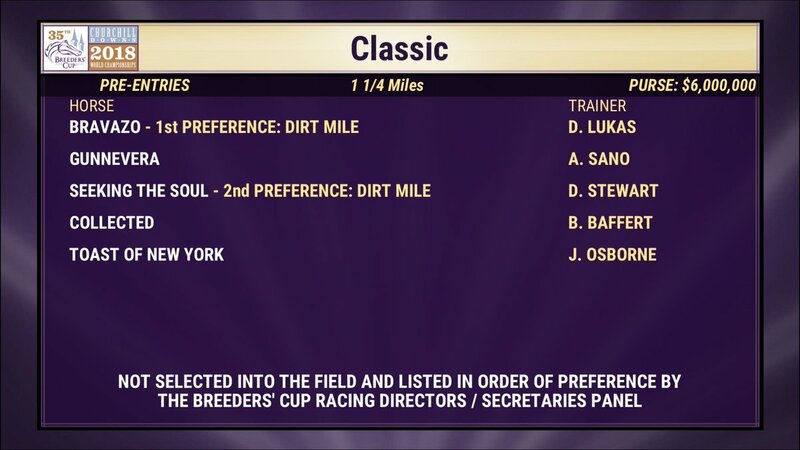 Those horses are in the Breeders’ Cup Classic. There is nothing you, I, or the panel can do about it. The system is the system. ETA: Starine posted it earlier tonight. It's an odd year, for sure. 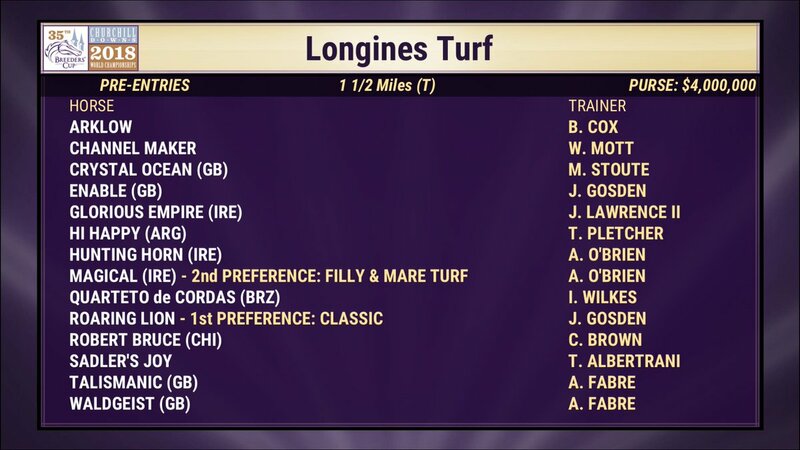 Most of the top tier, either open or restricted to 3yos, have been retired /injured. If the points races are any graded stake, then that (and some of the retirements/injurues) explains why the field might be top heavy with 3yos this year. It's hard to see horses like Thunder Snow and Biscuits being excluded, but it could happen I suppose. Whatever the case I just hope it winds up a contentious field with good betting opps. It's hilariously on-brand for this sport to institute a points system that A) nobody asked for and B) actively decreases the field quality of the year-end championship event. I guess we'll see what the final field is, but seriously, did nobody think to mention restricted races once during the entire process? Wait..wait...there’s a points system for the Classic? How long has that been in place? ...or have I just been “sleeping” on its existence? ...or has no one really noticed it before because it hasn’t really mattered until now? If Lone Sailor and Axelrod get in over Roaring Lion and Gunnevera it would honestly be a joke, not that the current industry is afraid to make them. Out of the three Bravazo deserves a spot the most, because his Gr.I-placings and Gr.II wins outweigh the former two’s minor stakes wins. He would still be better suited for the DM though. ...which really just makes it all the more ridiculous that nobody caught the restricted races issue. 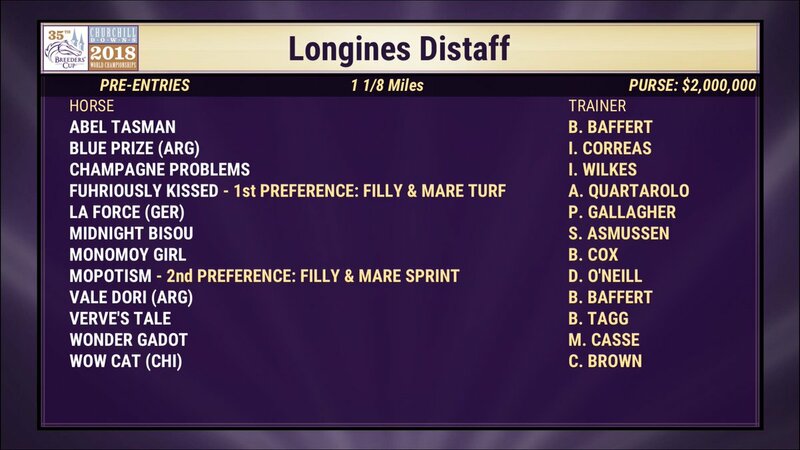 With this system, a horse who wins the Risen Star and the Oklahoma Derby before finishing third in the Pennsylvania Derby earns more points than a horse who ran second in the DWC, then took a long layoff and ran second in the Pacific Classic in their comeback race. I guess the hope would be that enough horses win enough Win and You're In races such that the points system doesn't even come into effect, or only selects one or two decent-quality horses... but I mean, play stupid games, win stupid prizes. There are probably a million ways the points system could be tweaked so that it worked more effectively, if the end goal is to get the best quality field for the Championship race. Watchmaker touched on a couple of good ideas in that article. The selection of W&YI races is a little strange overall. Some make sense (like the G1 Classic preps in Sept. Oct for dirt males), but the February Stakes? Seems like a weird race for a W&YI, especially since there's a gap until mid-June when the Foster is next in line. I'd also not be a proponent of any restricted race being a W&YI, but there they are (well it, the Haskell), and of equal value to races like JCGC and the Pac Classic. Seems like the idea was to get the winners of the 7 W&YI races as 50% of Classic field and then have a panel select the other half. Sounds good in theory, but those 7 races produced 6 winners and of those only 3 are left as actual race contenders. I've never heard of Nokono Yume though... maybe he would have been a viable Classic contender? Bolded. I think that's the answer. 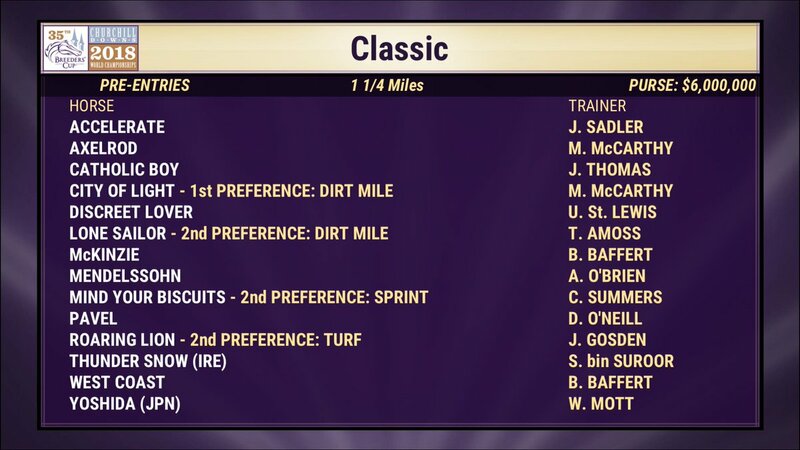 I just checked back and 2014 was the last time we had a full field for the Classic. If that's when the points system was instituted then it wouldn't have been noticed the following years since 2015, 2016 and 2017 had fields of 8, 9 and 11 respectively. Notes: I was surprised to see that Bravazo's first preference is for the Dirt Mile. In order for Gunnevera to draw in, both Bravazo and City of Light would have to head to their first preference. Thanks for all that info, Treve. The Paulick article showed the eligible entrants, but not the AE's. 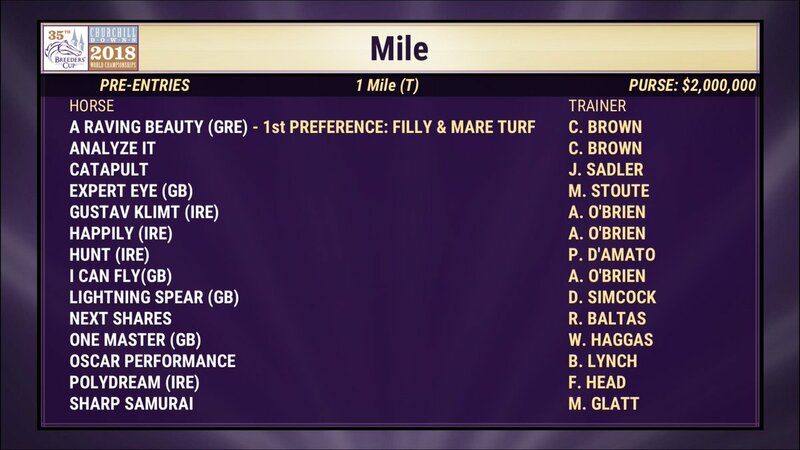 The Mile has so many horses that want to run in it, maybe because there is no dominant star this year? yes, thank you so much for posting those entries. I was surprised to see Collected entered in the classic. has he been training really lights out or something? because he didn't look so good in his last race. Looks like Gunnevera gets in if Bravazo and City of Light end up in their first choice races- apparently Bravazo's points didn't count because the Classic was listed as his second preference. I'm really relieved to see it; been looking forward to seeing Gunnevera run in this race for months now. I thought his Woodward was better than it looked, and it would be a real shame for his trainer's plan to backfire this late. Maybe not an overabundance of superstars this year (aside from Enable), but I can't complain about what look to be a number of large competitive fields. I haven’t seen anything. Or I don’t remember seeing anything. Based on this year’s form (which I know he wasn’t 100% in that stakes) I’m not sure he’d hit the board in this field.